Marcel Zajac takes on the Michigan State defense. 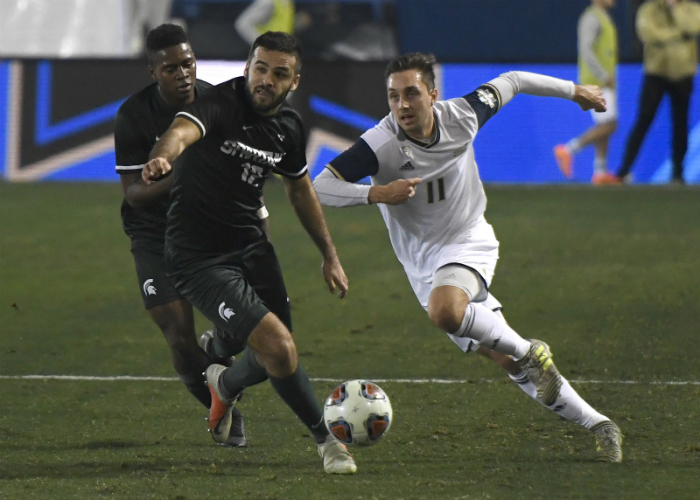 The Akron men’s soccer team avenged a loss in the College Cup semifinals to Stanford last season with a 5-1 victory over Michigan State on Friday night at Harder Stadium. The Zips have now won nine straight matches and are building on the excellent form they displayed over the last month of the season to advance to the National Championship on Sunday against Maryland. In the 23rd minute Michigan State nearly notched an equalizer when Hunter Barone broke free for a one-on-one opportunity, but Ben Lundt came out of goal for the save. The Michigan State onslaught continued in the 25th minute when Dejuan Jones unleashed a shot across goal that was saved by Lundt. Spartans’ forward Ryan Sierakowski gathered the rebound and sent a right-footed shot towards goal, but Akron defender Abdi Mohamed came up with a clutch leg save to protect the open goal. The Zips continued to make the most of their opportunities as Colin Biros’ corner kick in the 32nd minute found the head of Ritaccio who went high in the air and whipped a header into goal, increasing the Akron lead to 2-0. “That’s a free kick that I’ve practiced plenty of times. I could see that he took a step forward and I felt like he was leaning a little bit to the right,” said Harter of his game-changing goal that gave the Zips a 3-0 lead. The Spartans got a goal back in the 79th minute off a corner kick by Jack Beck that Patrick Nielsen headed into goal, cutting the Michigan State deficit to 4-1. In the 85th minute Akron punctuated the 5-1 victory with a goal by Braden Petno that came off a rebound of a Daniel Olveira shot that bounced off the crossbar. It was Petno’s first goal of the season. For the Maryland men’s soccer team the third time was indeed a charm when it came to defeating Big Ten Champion Indiana. The Terrapins relied on a bend, but don’t break defense and made the most of their opportunities on offense to secure a 2-0 victory over the second-seeded Hoosiers. Indiana defeated Maryland 2-1 during the Big Ten regular season and by virtue of penalty kicks in the Big Ten tournament T, 1-1 (4-3). Maryland midfielder Matt Di Rosa collected the ball in the box off a corner kick by Eli Crognale and drilled a right-footed shot into goal in the 37th minute. The shot was low to the ground and froze Indiana goalkeeper Trey muse. Scoring the opening goal of the game was key for the Terrapins as it allowed them to concentrate on executing a well-conceived defensive game plan that neutralized the Hoosiers’ strengths offensively. With Indiana dominating possession and pushing forward for an equalizer Maryland delivered a stunning second goal off a free kick by Eli Crognale that deflected off of a Indiana defender and ended up at the right foot of a sliding Donovan Pines, who flicked it into goal in the 79th minute, increasing the Maryland lead to 2-0. The second goal was a back breaker for Indiana and changed the dynamic of the match with just over ten minutes remaining as Maryland put the finishing touches on what will be a memorable upset.